When you’re searching for a basement waterproofing system, you’ll come across various systems. However, you’ll notice that most systems can be categorized as either internal or external waterproofing systems. You’ll therefore find that your main choice is between waterproofing your basement from the outside or the inside. One of the main factors to consider when choosing a waterproofing contractor and system is their warranty. Basement waterproofing is not cheap. You need to ensure that you’re covered in case of a failure after the installation of the waterproofing system. The problem with the warranties offered is that they are limited in either case. Exterior waterproofing systems offer a warranty that is limited only to the foundation walls. Any failure in other parts of the foundation will not be covered under the warranty. Similarly, interior waterproofing systems have warranties that are often limited to the floor area where the interior drain tile has been installed. This means that other parts of the floor as well as the foundation walls are not covered under the warranty. A combination system that includes interior and exterior waterproofing will have a warranty that covers both the floor and the foundation walls. You’ll therefore be covered for any failure involving the floor or walls after the installation of the system. Both exterior and interior waterproofing methods do not address the issue of relative humidity. High humidity in the basement can result in the growth of mold in the basement. A multi-step system addresses the four different ways that moisture affects a foundation. This includes relative humidity. You therefore won’t have to worry about mold or pest infestations in future. Interior waterproofing system on its own will not address the effects of exterior surface water on the foundation. It will also not address cracking or seepage through the walls of the foundation. Exterior waterproofing on its own doesn’t address water pressure against the floor and footer of the foundation. A multi-step waterproofing system is the only way to address all the issues that affect the foundation. 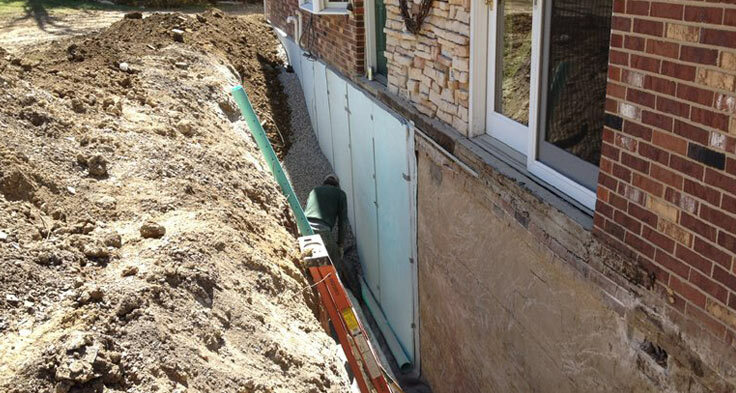 This type of system provides complete protection to the foundation by addressing hydrostatic pressure under and around the foundation. It prevents further cracking and seepage of water. Talk to your contractor about multi-step basement waterproofing to ensure the best results for your home.